You aren’t storming the gates with two of a kind, but it’s better than nothing. And having two Jacks, Queens, Kings or Aces will pack more than a little punch even though the probability of pulling a pair is 0.422569 – regardless of card value. Everybody loves twins. Well maybe not poker players. Two pairs are pretty good, but not great and can sometimes lure you into a big pot, only to have the rug pulled out from underneath you. Probability of two pair, a sharp drop from a single pair to 0.047539. Also known as “Three of a Kind”, this hand can get the job done if you’re playing at a smaller table. There are six hands that are going to beat the triple, so do a head check and bet accordingly. The probability of pulling out three of a kind drops significantly from two pair, to 0.021128. High or low, the straight is a solid poker hand. But, much like the triple, you’ve got to size up your field and know the chances of an opponent pulling a better hand. The consecutive five-card sequence holds a probability of 0.00392465. Getting five cards suited – but not in sequential order – holds a probability of 0.0019654, since there are just 13 cards of the same suit in a single 52-card deck. It’s a slightly behind the full house in terms of probability and rank, but stands well ahead of its cousin the straight. Not just a great 80’s TV sitcom but also a tremendous poker hand. You’ve got three of a kind and managed to pull two pair along with it. Holding a probability of 0.001441, your opponents will need to pull out a miracle to beat the full house most hands. The mighty quintuplets are a Top-5 poker hand and if a miracle is needed to beat a full house, than you might need the Pope in your corner to top four of a kind, which holds a slim probability of 0.000240. If you’re not going all in with four on the floor, you’ve wasted a gift from the poker gods. You could play poker for years and years and never see this hand come up. It’s the unicorn of 5-card poker, with not only five cards suited but also those cards run in sequential order. 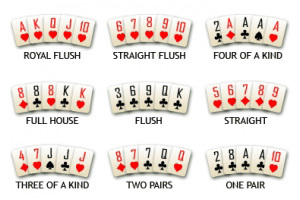 The probability of a straight flush – excluding the Royal Flush – is 0.0000138517. This is the great white whale of poker hands. The odds of a common golfer scoring a hole-in-one are 12,500 to 1. The odds of pulling a Royal Flush are 649,739 to 1 or a probability of 0.00000153908. Luckily, for you the odds of getting hitting by lightning are only slightly longer at 960,000 to 1.